I have just returned from DeKalb, Illinois, the home Northern Illinois University. It is also the home of barbed wire and there is a Barbed Wire Museum in town. Need I say more? No. Go. There are several Antique Stores in town. Mostly they are the kind that smell like candles scented with a secret recipe combining lavender and stomach acid. Handsome overpriced vintage ceramic bowls and lard tins mingle with folksy hand made 100% American knick-knacks that keep factories in China churning out bolts of calico. But there is one true junk store in town that really has junk. The front of the store is chock-a-block with hand tools, some of which might have actually worked 30 years ago. I really liked this store and wish that I had the time to go through the box of vacuum hose attachments I saw in a corner. There were lots of LPs in and out of their sleeves, pre-scratched to save you the trouble. I was very impressed to find a coagulation of five copies of Vaughn Meader’s “The First Family”. Actually, there was a sixth copy, too, but it was out of its sleeve moonlighting in a box of Frisbees. Several times a day, a train rolls through town and the mournful whistle blows to remind you that you are in the heartland of America, though you could remind yourself easily by a glance down Main Street at the empty storefronts since all the commercial action is at the mall just outside of town. I gave three lectures in two days at NIU and spent a third day critiquing 15 graduate painting students of my pal, Katie Kahn. I saw some very good painting by these hard working young people and I feel privileged that I had the chance to encourage them. I was also thrilled as hell to get paid to tell other people what to do with their work. Ooo-whee, doggie! Ain’t that a kick! The Museum at the University asked me to curate an exhibition that I had originally titled, “Hey, Stoopid! 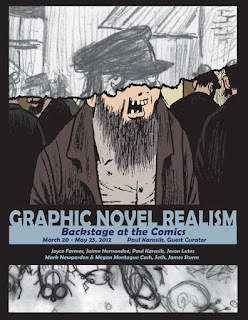 Comix R Cool!”, but which is now called, “Graphic Novel Realism: Backstage at the Comics” (whatever that means!). Josephine Burke, the Director of the Museum and her crew magically transformed my exacting and intricate floor plan written in crayon on the back of a cocktail napkin, into a very handsome exhibit that I encourage you to go see before the end of May, 2012 featuring the work of Joyce Farmer, Jaime Hernandez, Jason Lutes, Mark Newgarden & Megan Montague Cash, Seth, James Sturm and myself. For those looking for something a bit more lowbrow, there is an exhibit across the hall of Goya’s Los Caprichos.